The story of Indian perfumes is as old as the civilization itself. Archaeological evidence shows the earliest inhabitants of the Indian subcontinent held plants in great reverence. With the passage of time, scented oils were extracted by pressing, pulverizing or distilling aromatic vegetable and animal produce. Early indications of this activity are available from the perfume jars and terracotta containers of the Indus Valley civilization, where archeological work has revealed round copper stills, used for the distillation process that are at least five-thousand years old (reference req.). These stills are called degs. Following the seasons of the flowers, traditional ittar-makers, with their degs, traveled all over India to make their fresh ittars on-the-spot. Even now, a few traditional ittar-makers still travel with their degs to be close to the harvest. A large number of references to cosmetics and perfumes in Sanskrit literature were found like in the Brhatsamhita is a 6th-century Sanskrit encyclopedia by Varahamihira (505 AD  587 AD). Cosmetics and perfumes making were mainly practiced for the purpose of worship, sale and sensual enjoyment. Gandhayukti gave recipes for making scents. It gives a list of eight aromatic ingredients used for making scents. They were: Rodhara, Usira, Bignonia, Aguru, Musta, Vana, Priyangu, and Pathya. The Gandhayukti also gave recipes for mouth perfumes, bath powders, incense and talcum powder. The manufacture of rose water began perhaps in the nineteenth century AD. The earliest distillation of ittar was mentioned in the Ayurvedic text Charaka Samhita. The Harshacharita, written in 7th century AD in northern India, mentions use of fragrant agarwood oil. 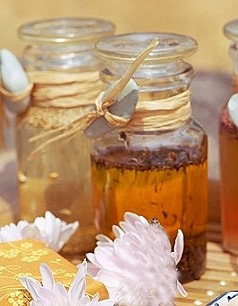 In ancient India, ittar was prepared by placing precious flowers and sacred plants into a water or vegetable oil. Slowly the plants and flowers would infuse the water/oil with their delicate fragrance. The plant and flower material would then be removed and a symphony of their aromatic beauty would be held in the ittar. These ittars were then worn as a sacred perfume or to anoint. Ittar figures into some of the romantic stories of a bygone era. Its patrons included great poets like the legendary Mirza Ghalib. When Ghalib met his beloved in the winter, he rubbed his hands and face with ittar hina. In Ain-e-Akbari, Abul Fazal, has mentioned that Akbar used ittar daily and burnt incense sticks in gold and silver censers. A princess's bath was incomplete without incense and ittar. A very popular ittar with the Mughal princes was ood, prepared in Assam. Situated on the banks of the sacred River Ganges, 80 km from Kanpur in Uttar Pradesh, is the now almost forgotten ancient city of Kannauj, once the capital of the famed Emperor Harshavardhana. Today it prides itself as the 'Attar City' or the perfume city of India. Kannauj in Uttar Pradesh India is a major producing city of ittar. Here, there is a legend on how the first ittars were made in the area. The forest dwelling Faqirs and Sadhus (ascetics) used certain perfumed jungle herbs and roots in their bonfires during the winters. The shepherds who grazed their sheep in that region found the perfume lingering in the burnt wood long after the ascetics left the place. Word spread about this and some enterprising people searched and found the fragrant herbs and roots. Then the experiments on ittar began and the first ittars to be made were Rose and Hina.